Heat two cups of water. Add the lemongrass tea bags to make an infusion. Put tea aside. In medium pot, boil over medium heat; heat the rest of the water with the fish fillets marinated to taste to make the broth base. Cook for 10 to 15 minutes. Add a fish bouillon cube. Place ginger in broth (remember to remove it when the soup is ready). In another pot, prepare the Vermicelli noodles following the package instructions. Drain the pasta and distribute in each soup plate. Add the tea and shrimp to broth, and cook for two more minutes. 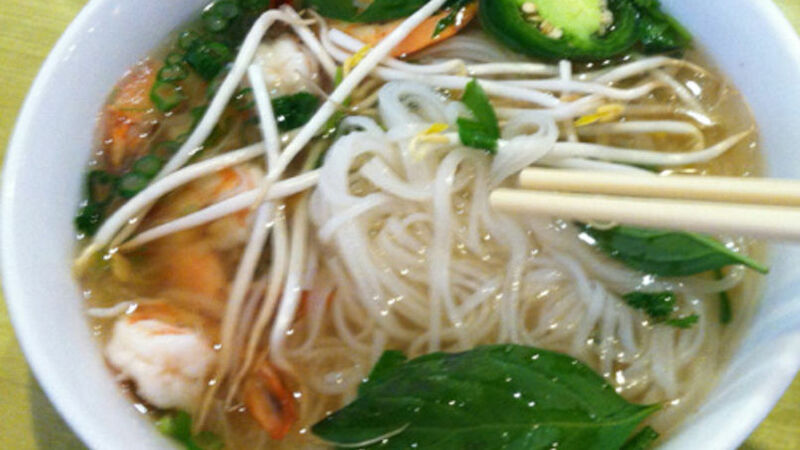 Serve the broth with the shrimp, and add fish pieces in each soup plate, on top of the noodles. Add peppers on top of each soup plate. Put the fresh herbs, Chinese roots, lemon and jalapeños on a plate, so everyone can add to their soup to taste. Also bring the fish sauce to the table so you all get a chance to add a little bit. Chinese spoons and chopsticks make it easier to eat this noodle dish, and it makes for a very appetizing experience for adults and children alike. My daughters, like so many other kids, love all kinds of pasta. Since they were very little, I tried to invent sauces for noodles by blending pure vegetables. One time we went to a Vietnamese restaurant, and the kids, who were used to eating some green 'things' on top of their pasta, found these noodles delicious and fun to eat. I love this style because it is served with a lot of fresh vegetables, which can always be varied and added to others you have (sometimes I change my recipe and add cilantro, avocado, tall greens or golden onions in butter). Enjoy this deliciousness with everyone at home!